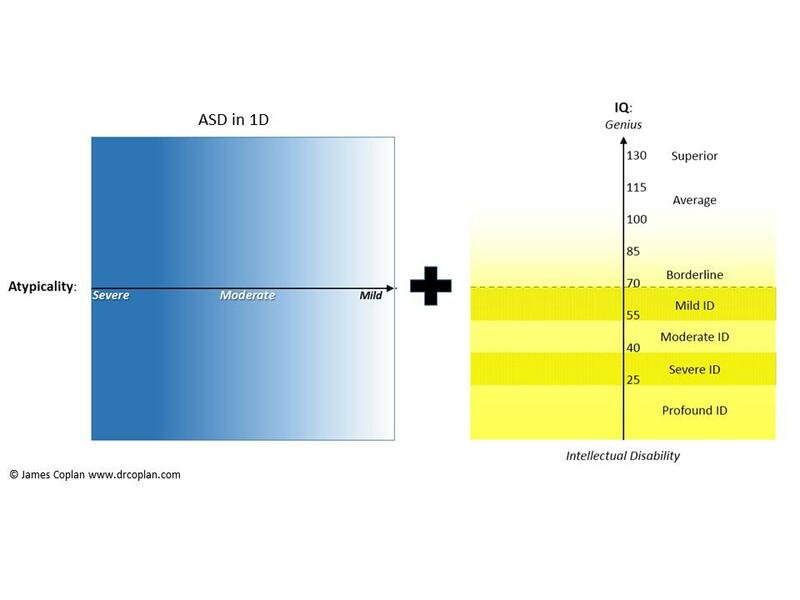 Dr. Coplan shows how to take the leap from a one-dimensional view of ASD, to a 2-dimensional universe that simultaneously incorporates degree of atypicality and level of intelligence. So far I have addressed items 1-3, and have just begun to discuss item 4. Two posts ago I introduced a Figure that displays the spectrum of atypicality from severe to mild, shading over into the “Normal” range. Last week I introduced second Figure that displays intelligence, ranging from profound Intellectual Disability to Genius IQ. I picked blue to represent the degree of atypicality (Figure 1), and yellow to pick the degree of intellectual delay (Figure 2). In each case, the color fades as things get better / milder: dark blue = severe atypicality; dark Yellow = severe Intellectual Disability. Notice that the axis for Figure 1 (Atypicality) runs horizontally, while the axis for Figure 2 (Intelligence) runs vertically. If you took geometry in school, you will recall that the horizontal axis is called the “X” axis, and the vertical axis is the “Y” axis. (Stay calm! There’s no math here. Just labels. You’ll do fine.  ) Now that we’ve laid the groundwork, we are ready to continue our discussion of item 4. This is where things start to get interesting! Now we will combine Figure 1 and Figure 2 into a single graph, with atypicality on the X axis, and IQ on the Y axis. When we combine the two individual Figures, the lower left corner – which is comprised of deep blue (severe atypicality) plus deep yellow (severe Intellectual Disability) – comes out green! The upper left hand corner (Severe atypicality plus normal IQ) remains deep blue. The upper right hand corner remains light blue, shading over to white, or “Normal,” represented by the dotted arrow continuing beyond the right-hand edge of the graph, and the lower right hand corner is mainly yellow, signifying the fact that individuals in the lower right-hand corner of the graph are challenged mainly by their ID, although perhaps with a touch of atypicality. 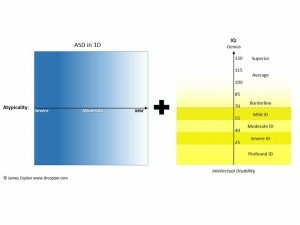 Along with the different colors, the labels in the various corners of the graph reflect the different combinations of atypicality and IQ: High Functioning Autism (HFA), Low Functioning Autism, Asperger Syndrome, and in the “Non-autistic” range just beyond the right-hand edge of the graph, a slew of “borderline” diagnoses, including Nonverbal Learning Disability, Semantic-Pragmatic Language Disorder, Sensory Integration Disorder, and Broad Autism Phenotype (what adult psychologists refer to as “NQA” – “not quite autism”). Voila! Now we have a way of looking at the two key variables that determine clinical presentation for children with ASD at the same time. Instead of quibbling over how many points a person may have on a diagnostic scale, we can see the whole terrain laid out before us. Just as Copernicus took the earth out of the center of the solar system, I have taken ASD out of the center of my model of the developmental universe. Atypicality is still present, but now instead of looking at it in isolation, or as the central focus, this graph enables (or forces) us to consider atypicality and IQ at the same time, and in relation to one another. Very cool. And very helpful when considering long-term prognosis, because this combination of atypicality and IQ determines not only the child’s present clinical appearance, but his or her future. IQ plus Atypicality determine clinical presentation.